Coolabah Shades Canopies are made from strong lightweight extruded aluminium frames that can also be powder-coated if desired. They are all custom made and can be uniquely shaped to blend with any type of architectural design. With a wide variety or styles including Bow, Colonial, Dutch, Wedge, French, Shop Front, and Extended Dutch etc. our range of Shade Canopies in Melbourne can be the perfect solution if you are looking for a fixed lightweight shade structure over doors or windows, either at home, shops, business or restaurants. 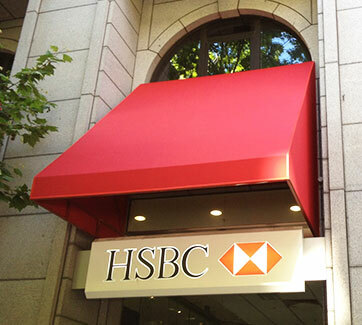 Available in various fabrics and colours, Canopies can be sign written and/or illuminated to promote your business. For more information or to discuss your special needs, just email or telephone and one of our friendly staff can arrange to meet with you for a free no obligation measure and quote - or go to our contact us page. Looking for authentic window canopy designs to match your building’s period architecture? Or after a simple, lightweight way to shelter windows and doors from direct sun and rain? At Coolabah Shades, we offer a wide range of frames, colours and metal powder-coating so you can find the window canopy that suits your own particular situation. With classic designs, including Colonial, Shop Front and Extended Dutch Hood, window canopies don’t need to take away from your building’s signature look. 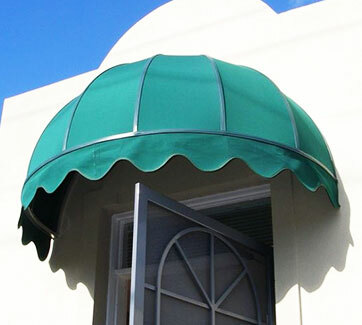 With a treated and water-proofed fabric structure that comes in a range of colours, along with an option to powder-coat your frame into classic brass or gold tones, you can rest assured that the team at Coolabah Shades will help you find the ideal window canopy design during their obligation-free quote and measure. Not just a way to add visual distinction to your business, a window canopy design from Coolabah Shades can be sign-written to maximize brand recognition. Whether you’re developing a visually striking shopfront or a low-impact means of protecting windows at your company office, a sign-written window canopy is the ultimate investment in on-site promotion. The team at Coolabah Shades is committed to working with you to ensure customer satisfaction. During our obligation-free quote and measure, we’ll show you our full range of window canopy options. Helping you mix and match designs, fabrics and frame powder-coating, our skilled professionals are experienced in finding aesthetically-pleasing, functional shade solutions. Whether it’s for your business, shop or home, a window canopy from Coolabah Shades is a perfect union of form and functionality. Dutch Hoods are one of the most popular styles, providing a classic and timeless look. Dutch Hoods are particularly complementary for businesses like European restaurants or barbershops, although Coolabah Shades can alter the design to best suit your business, no matter what it is. French Canopies provide extended protection from the elements, whilst giving your home or business a classically beautiful look. Choose a colour and material that best complements your business, and Coolabah Shades is sure to deliver the perfect French Canopy for you.